Donal Logue wants his child back no matter what. The 51-year-old Gotham actor took to Facebook on Saturday to share a heartbreaking image of his child Jade. 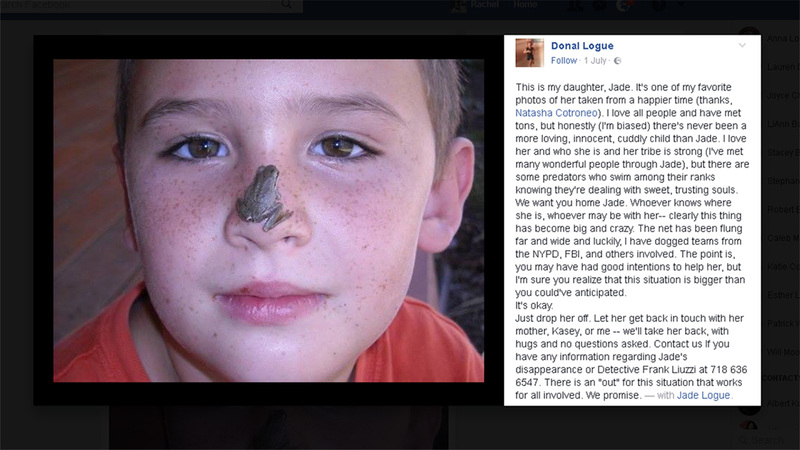 The sweet photo features Jade and a tiny frog, and Logue used the caption to once again plea for Jade's safe return. "This is my daughter, Jade," he wrote. "It's one of my favorite photos of her taken from a happier time (thanks, Natasha Cotroneo). I love all people and have met tons, but honestly (I'm biased) there's never been a more loving, innocent, cuddly child than Jade." The actor went on to seemingly reference people in Jade's life who might not wish the 16-year-old well, writing, "I love her and who she is and her tribe is strong (I've met many wonderful people through Jade), but there are some predators who swim among their ranks knowing they're dealing with sweet, trusting souls. We want you home Jade. Whoever knows where she is, whoever may be with her-- clearly this thing has become big and crazy." Logue went on to note that he and his family have involved many officials in the search for Jade, writing, "The net has been flung far and wide and luckily, I have dogged teams from the NYPD, FBI, and others involved. The point is, you may have had good intentions to help her, but I'm sure you realize that this situation is bigger than you could've anticipated. It's okay. Just drop her off. Let her get back in touch with her mother, Kasey, or me -- we'll take her back, with hugs and no questions asked." Logue first revealed that Jade had gone missing on June 27, and since then has made many pleas on social media for her safe return. He concluded his most recent post by giving the public information on how to get in touch if they know anything about Jade's whereabouts, writing, "Contact us If you have any information regarding Jade's disappearance or Detective Frank Liuzzi at 718 636 6547. There is an 'out' for this situation that works for all involved. We promise."